Double H Ranch provides specialized programs and year-round support for children and their families dealing with life-threatening illnesses. The home page places greater visual emphasis on the Double H Ranch experience as heartwarming camper photos are shown throughout the page. Bold headings, fun fonts, and prominently displayed calls-to-action capture visitors’ attention and encourage them to learn more about the programs, camp experience, and ways to support the non-profit. From camper application forms to session dates to FAQs and more, there’s no shortage of helpful information when it comes to Double H Ranch’s year-round programs. Getting this information before camp begins is essential for prospective campers, their parents and/or caregivers, volunteers, and hospital coordinators alike, so the content must be easy to find on the website. By organizing this information in a way that’s appealing to the eye and easy-to-locate, the website makes it easy for visitors to find all of the necessary information about the programs so that they’re fully prepared for the magical experience ahead! An easy-to-use events calendar simplifies the process of searching for upcoming events such as community work days, fundraisers, and the ever-popular Double H Ranch Annual Gala. After seeing a list of upcoming events, visitors are encouraged to click-through to detailed event landing pages where they can get more information, add an event to their calendar, and share it with friends on social media to help spread the word! Because the site is built with mobile-friendly responsive design, visitors can easily discover upcoming events from their desktop or smartphone device. Contributions have a profound impact on Double H Ranch, as every volunteer, sponsorship, and donation helps the organization fulfill its mission. The “Get Involved” section uses a visually captivating layout that couples fun photos (volunteers, special events, and corporate events) with the power of the written word to introduce visitors to the many ways they can support Double H Ranch. When words aren’t enough to thoroughly convey the magic of Double H Ranch, it’s up to visual content such as photos and videos to drive the message home. 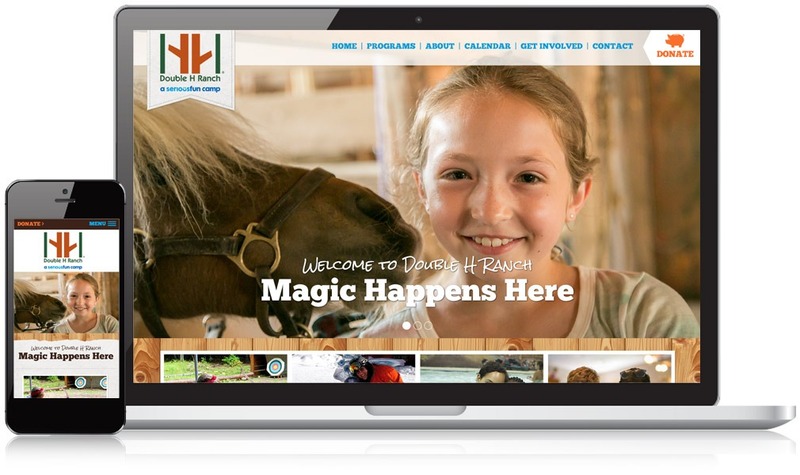 Double H Ranch has an abundance of inspiring photos and videos that illustrate the camp experience, so they needed a convenient place to house that content on their website. Today, these heartwarming photos and videos are featured in a user-friendly slideshow gallery which allows visitors to view content and get a visual understanding of what makes Double H Ranch so special to the many lives they touch. The Mannix team is knowledgeable, attentive, & exceedingly helpful. They have made it an incredibly smooth process from the beginning design stages to the launch of our new site, which is cleaner, has a more attractive design and improved navigation. Mannix also consults with us on social media and e-mail marketing. Their team has been an integral part of our marketing and communications success and we appreciate all they have done for us over the years! Ready to get started or want to learn more about how we work with clients? Let’s get it scheduled.